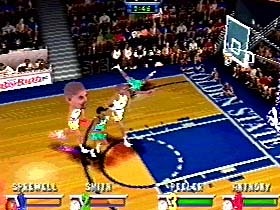 NBA Jam has a legacy much larger and deeper than most people realize. It’s spin-offs and sequels are numerous, some of them grand, many of them awful, but at their core they’re the same. So, ignoring the attempts to turn the series into a legit simulation franchise back on the N64 (those fall under the worst by default), MultiplayerGames is looking at some of the best and the worst games in this storied franchise, in celebration of its long overdue rebirth on modern consoles. From the moment the impossibly cheesy rap tunes start blaring over the menu, you know this is going to be special, and it was. 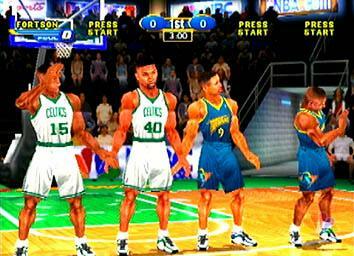 This is the evolution of NBA Jam, unfortunately released when most people were too tired of this series to care. Hangtime removed Tim Kitzrow from the announcing booth, replaced by someone with no enthusiasm, but the core gameplay is where it shines. The addition of fade-aways and spin-moves changed the game by loosening it up, plus offering more fluidity on offense. It’s a subtle change that does not get enough credit. The digitized graphics were improved, and the rosters greatly expanded, not to mention created players. The 16-bit home ports lost quite a bit in the process, but the N64 and PlayStation versions are just perfect if you’re not willing to fork up the money for an arcade cab, and most people aren’t. This should not be confused with the awful NBA Hangtime ’95 for the Sega CD. With the same gloriously overdone sprites, kooky cheats, and familiar gameplay, it’s easy to overlook this as just a simple rehash. Tournament Edition was so much more though, expanding the rosters past their confines of two players, and opening it up to special teams like the Rookie squad. Wisely, an new stat was added, the injury, preventing gamers from using the same player for the entire game, a change that adds an additional layer of strategy between quarters. This was apparently lost on the programmers of the latest NBA Jam on the Wii, PS3, and 360, making the increasingly large rosters meaningless. To be fair, NBA Showtime didn’t exactly light the world on fire with innovation, but it was the first game in this franchise to do 3D right. Add in the familiar music of NBC basketball telecasts and you have an entry that captivates hoops fans from the start. This brings with it all of the features from before, including injuries, create-a-player, spin moves, fire mode, and the same speed. The muscle-bound players are great, and the pushing before the game even starts sets the right mood. It’s a great addition to the series, even if it may not look like it on the surface. A follow-up to NBA Showtime, this one reeks of desperation to find something new, and changes 2-on-2 to 3-on-3. The added player may sound like extra weight, but in reality, it does add to the gameplay enough to feel fresh. The usual tactics you used in prior games go out the window when there’s an extra body to content with. On top of that, the game actually offers full season play, a first for the arcade-style games in this series, and a means to keep playing beyond the “beat all of the teams” mode. An attempted revival of the original, much like the current gen update, but keeping the 3-player aspect from Hoopz. What it lacks in charm, the rather ugly polygonal models hardly doing the series any favors, the gameplay is close to what we remembered from the original. It was probably a little too fast and the camera angle was a poor choice considering the crowded conditions, resulting in the not-too-favorable reviews. The lack of modes didn’t help either, but there’s enough here at the core to give it a boost into the underrated category, and playing as classic players remains a blast. Ouch. Marv Albert commentates with zero enthusiasm, his only quote for making two in a row being, “I smell smoke.” The game goes 3D for the first time with hideous results, the blocky players and wavering framerate just the beginning of the problems. The idea of goofy animations, like the ball turning into a brick when a shot is missed, are just distractions, not additions. Plus, you then know what the shot will be, eliminating the need to guess whether to try a block or just rebound. A pitifully executed title, and the worst in this entire franchise’s history. The engine was utilized for the rarely seen NBA 2 Ball demo handed out at the 1997 NBA All-Star Game. This feeble attempt has one positive aspect: editing players. 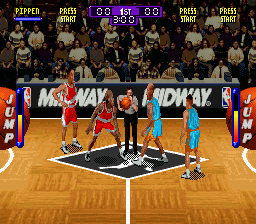 The rest is a carbon copy of NBA Jam, ported to the same consoles with the exception of the Game Gear. Power-ups are added, creating (like Extreme) pointless visual effects and things like “super turbo.” There are 40 teams which means unless you like a popular squad, your team isn’t here. Not even the intro carries any positives, the video awash with some type of metallic filter that is as gaudy as they come. The sound effects are awful, the ball hitting the court like it’s made out of tin, and the gameplay is silent except for college fight songs and very few Kitzrow quotes. why cant i play it!!!!!!!!!!!!!!!!!!!!!!!!!!!!!!!!!!!!!!!!!!!!!!!!!!!!!!!! Corrected. Guess when you type “Jam” that many times it just sort of sinks in.